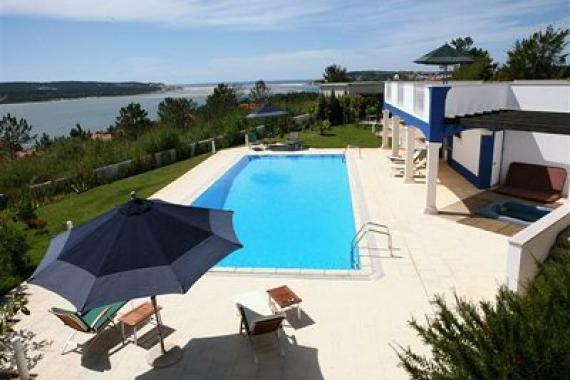 Holiday villa Bolero is for rent in a small beach resort in Foz do Arelho near Praya del Rey in Portugal, 60 km north of Lisbon. This lovely holiday villa with 4 bedrooms, 3 bathrooms and a heated swimming pool with jacuzzi enjoys beautiful views of the Atlantic Ocean! Holiday villa Bolero comprises two floors. The entrance hall leads into the lounge with a comfortable lounge suite around a fire place and TV set. The dining area in the kitchen seats 8. The fully fitted kitchen has all modern appliances. There is an utility room with washing machine and dryer. This lovely holidayhome has four bedrooms. The master bedroom with ensuite bathroom has an extensive private terrace. There is a further double bedroom with ensuite bathroom. The other two twin bedrooms share a shower room. The lounge opens onto a huge, partly covered terrace with comfortable terrace furniture, perfect for al fresco dining. The holiday home is surrounded by a large garden. There is a heated swimming pool with jacuzzi and a pool house with dining facilities, a fridge/freezer and bar area. In a corner of the garden is a lovely gazebo with a dining suite and a built-in BBQ, commanding beautiful views of the lagoon.There is ample parking space. This holiday villa is for rent near Praya del Rey approx. 60 km. north of Lisbon (Portugal). It is a one hour drive to the airport and the centre of Lisbon. Within a 30 min. drive to various little towns with lots of shops, restaurants and local markets. Washing machine/ tumble dryer/ hob/ oven/ microwave/ dishwasher/ fridge/ freezer/ cable TV/ DVD/ CD player/ heating/ pool heating/ BBQ. Comfortable terrace furniture, sun beds. Maid service once a week. Bed- and bathlinen is changed once a week.